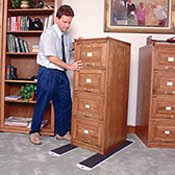 Carpetstretcher.net offers a full line of furniture movers to make moving large and small pieces of furniture easier on you and your back. This weeks featured product is the 48" EZ Move Furniture Slides. The 48" EZ Moves were designed to help you move any object, heavy or light, with ease. They are extremely easy to use. Simply place the EZ Move Slides underneath the object being moved by lightly tilting the object, and then push or pull the object to its destination. Easily turn corners and move through spaces that would normally take 2 or more people and turn it into a one man job. The 48" EZ Moves Slides are sold in a set of 2. For more information on the 48" EZ Moves Slides, CLICK HERE.